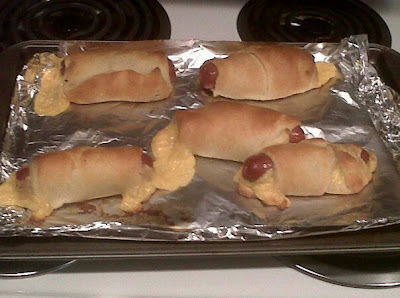 So last night I see that my favorite nephew-in-law (we'll call him Tommy) has posted a most tasty looking photo. That photo prompted a very interesting and informative virtual kind of conversation. Eleven comments and three likes. . . . Not bad. Not bad at all. 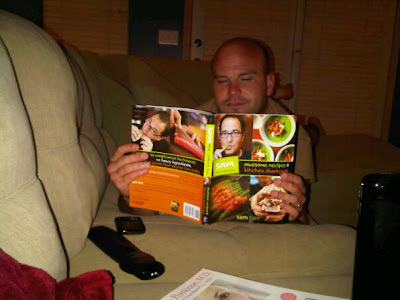 It was especially intriguing to learn that his inspiration for this delectable food vision was The Biggest Loser. Now, I've never actually watched The Biggest Loser, but I have seen the commercials. . . and I just looked it up on the internet to verify that I really knew what I was typing about. Yup. I can see how the show would be an inspiration to eating healthier and wiser. Well. . . This is Tommy's version of eating light. Or something like that, anyway. Look yummy - don't they? Wanting the recipe, aren't you? Wipe the drool off your chin. . . Seriously. No worries. I got the recipe. 3. Wrap two croissants around each cheese-wrapped frank. 4. Bake on cookie sheet at 350 for 12 minutes. 5. Let cool for 30 seconds and serve. And YES - you WANT all beef franks. Are you kidding? You truly don't know what are in those 'other ones.' Scary. Oh, BTW. Contrary to the most current rumors, Chef Tommy is not really a chef. I know. . . I know. . . hard to believe. But he's The Garage Door Guy who loves my niece, watches the Biggest Loser, and likes to cook. And, like his 'lite' recipe, is a weiner ummmm. . . . I mean Winner! Here's Tommy catching up on some reading. . . or looking at the yummy-pictures. It is a cookbook, after all.